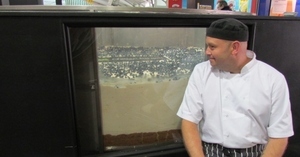 At the International Cheese Awards (hosted at the Nantwich Show), a team from Asda worked tirelessly to mix, build and decorate the world's biggest ever Cheesecake. Allweighs were asked to provide equipment to verify the record, to ensure it beat the existing benchmark of 2133.5kg, set by a team in Mexico in 2009. Ever the optimists, we provided a platform scale that went up to 3000kg in capacity, weighing across four load cells with two remote displays so the gathered spectators could witness the unveiling. With several kilos of Blueberries added to hopefully take them that little bit further over the mark, the remotes were activated and a few tense seconds were spent waiting for the display to boot up. The crowd cheered as the display clocked an impressive 2155kg - beating the current record by just shy of 22kg! "I was confident in the equipment and the construction, however as with anything you don't know 100% until the readout pops up! It was especially stressful as so many people had put so much work into the cheesecake, so I'm glad everything passed off without any problems." Anyone interested in large-scale industrial platform scales can contact us for a competitive quote.